Due to high demand, there is currently about a one week lead time on this pitching machine before it ships, no matter where you purchase it. 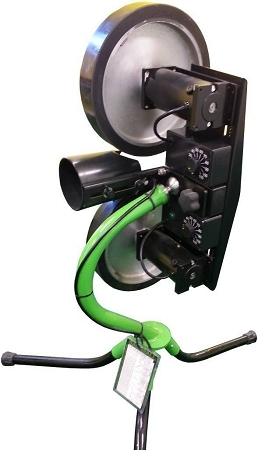 Manufactured entirely in the U.S.A. by Spinball Sports, the Spinball Wizard 2 Wheel Pitching Machine is almost the same exact machine as the Rawlings Pro Line 2 Wheel Pitching Machine, which they also manufacture for Rawlings. The Spinball Wizard is $500 less expensive, though, and an extremely popular machine with high school and college programs. The only differences between the Spinball Wizard pitching machine and the Rawlings Pro Line 2 Wheel machine is that the Rawlings Pro Line 2 wheel pitching machine has a handle on it for steering the machine for defensive drills and, because it is a little heavier than the Spinball machine, the Rawlings machine has transport wheels on it. If you are going to use the pitching machine exclusively for batting practice, there's no reason to pay an extra $500 for the Rawlings machine unless you think their logo is really worth that much. Like the Pro Line 2, the Spinball Wizard can pitch fastballs, curves, changeups, sliders, screwballs and even knuckleballs up to 100 MPH. The Spinball Wizard features a unique, patented ball and socket adjustment clamp that lets you change the horizontal and vertical alignment as well as the wheel angle with a single adjustment. That not only lets you change pitch locations in one smooth move, but it is great for defensive drills, too. You can throw grounders and towering fly balls with one simple adjustment. Engineered with aerospace grade steel, the Spinball Wizard is definitely the lightest 2 wheel pitching machine made. It only weighs 59 pounds - about half the weight of competitors' two wheel pitching machines. Despite being comparatively light, it is super rugged and features an outstanding 5 Year Warranty. It is powered by any standard 110 volt electrical outlet. Unlike pitching machines which use air filled tires, the Spinball Wizard pitching machine uses solid wheels with one inch thick urethane treads. Not only do they last longer than air filled tires, they pitch truer, always stay in balance and have a far shorter recovery time between pitches. 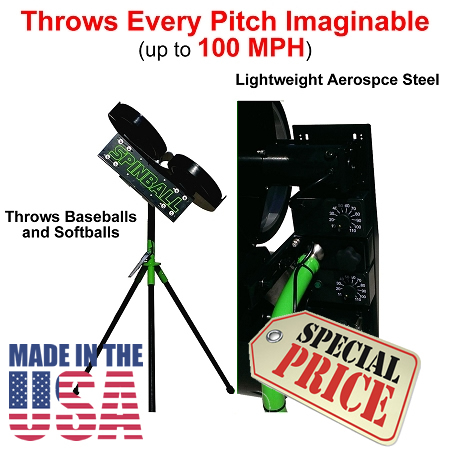 Instead of having to wait 8 seconds between pitches like you do with other pitching machines, the Spinball Wizard Pitching Machine is ready for its next pitch in under 3 seconds. Our discount Spinball Wizard 2 Wheel Pitching Machine ships for free to the continental United States and it includes a laminated color chart to show you how to set the wheels to throw various pitches. For the ultimate in convenience add a Spinball Wizard Automatic ball feeder so that you can practice solo! Great product! Been using an ATEC machine the last several years that was pretty inconsistent and way more expensive. This pitching machine is MUCH more accurate. Glad I made the switch! I was torn between the First Pitch Curveball and Spinball machine and called and talked to someone at the website. I decided on this machine because it was lighter and I use it on the field for team practice. Works as advertised and i really like the chart that comes with the machine that shows how to set up the different pitches. I purchased it for my 12 year old grandson and he loves it. (and so does his Dad). He had a Birthday party with his baseball team invited and they all enjoyed it. Many of them found out they needed more batting practice and want to come back for more. I am sure my Grandson will enjoy this for many years to come. He is planning to stay with baseball thru his later years and into college hoping to eventually to go professional. I’m sure he has the will to do so. Thanks again for the superior quality product. I was looking for a pitching machine for my nephews that could easily be set up to pitch, to throw ground balls, and to throw fly balls. This machine does all of these with precise accuracy. I am glad that I settled on the Spinball Wizard and my nephews are glad too. I am quite pleased with the Spinball Wizard 2 Wheel Pitching machine. I purchased the machine for my 11 yr old grandson's birthday. He and my son, his father, have been enjoying the machine since. My son has nothing but praise for the machine and is looking forward to the spring of 2019 to share their joy with my grandson's baseball teammates. Q: I could use this machine for baseballs and sofballs? The only thing I have to buy are the legs for softball right? This machine can definitely throw real baseballs or softballs but like all pitching machines, it is recommended that you use dimpled balls. Dimpled balls pitch more accurately, last practically forever and do less damage to pitching machine wheels than balls with seams do. Due to the pressure exerted on real balls by pitching machine wheels, ALL wheel driven pitching machines will eventually cause the glue that holds the cover on a real ball to break away from the cover, causing the balls to go mushy and ultimately have their covers ripped off of them. This is especially true of softballs, which have very thin leather covers. All pitching manufacturers tell you that if you decide to use leather balls, only use the highest quality leather balls and definitely do not use a synthetic cover "real ball" ball or any ball that has a protective/glossy coating on it. Q: Are there size (dimensions) details averrable. I understand weight is approx 60 lbs. Length of legs? I'm trying to purchase or build a custom cart to transport from parking lot to field/outdoor cage. Thanks. A: According to Spinball Sports, there are several rolling utility carts that you can purchase from WalMart that should do the trick. Many people use them for shopping carts or for bringing equipment onto ball fields. According to the manufacturer, the machine with the legs attached is about 5 1/2 feet tall. Unattached, the legs are about 40 inches long. It is three feet wide with the legs attached and about 16 inches wide without the legs. The depth would also be 3 feet with the legs attached but approximately 1 foot without the legs. Frankly, I would purchase the machine and see if the inexpensive WalMart carts work before going to the trouble of engineering something, myself. Q: What size generator would you use for this machine to work accurate and long? A: The Spinball Wizard 2 Wheel Pitching Machine would require a 1,000 continuous duty watt gas generator. PLEASE NOTE: If using an inverter and a battery instead of a gas generator, it must be a true sine wave generator (not modified sine wave) - VERY EXPENSIVE! Q: What happened to the $50.00 coupon from yesterday, May 15 ,2018 seen on your website? A: Coupons come and go on the website as do sales. Some coupons are only shown on weekends or certain times of the day/night. Just because you don't see a coupon anymore, doesn't mean that it no longer works. Give it a try or, better still, give us a call and we'll let you know if there are any hidden deals available. A Spinball Wizard two wheel pitching machine can throw any dimpled pitching machine baseballs, lite balls or regulation baseballs. If you are going to use regulation balls, please only use the highest quality leather balls and realize that they will not be as accurate as dimpled balls. Also know that the seams on real balls will wear your pitching machine wheels out faster and that pitching machines are known to rip the covers off of real balls - especially softballs, which have very thin covers. We don't want anyone to be unhappy with their purchase, so Spinball Wizard pitching machines may be returned for any reason within 30 days for a full refund minus a 15% restocking fee. The 15% restocking fee is calculated from the normal sale price and not from any additional discount coupons that may have been used. This fee is the lowest in the industry and covers our outgoing shipping costs, non-refundable payment processing fees charged to us by credit card companies, processing and packaging expenses and minor cosmetic damage to the machine. It is the customer's responsibility to pay for shipping back to Spinball Sports. Spinball Wizard pitching machines are covered for 5 years for residential use or 1 year for commercial use. This warranty is prorated for the wheels, just like car tires. For example, if a wheel only lasts 3 years (60% of rated life) we will give you discount of 40% on a replacement wheel. No matter where you order a Spinball Wizard Pitching Machine from, NOBODY actually stocks them; they all ship directly from the manufacturer's warehouse located in Mt. Vernon, Illinois. Therefore, the shipping time frame is exactly the same no matter what website you order from (we hope that it is this one!). Spinball Wizard Pitching Machines typically take 3-5 business days to ship from the time you place your order. They ship via Federal Express (FedEx) Ground and could take anywhere from a day or two to a week to get to you AFTER being shipped, depending on your proximity to their warehouse. We will notify you of your tracking number the moment we receive it from the manufacturer's warehouse. Click here to download an easy to read, printable PDF of the Rawlings Pro Line 2 Wheel Pitching Machine Owner's Manual.